It is not everyday that I get to dine at a bougie establishment like Bacchus, so you can only imagine my excitement when I received an email from the Executive Assistant at the Wedgewood Hotel. I have walked past Bacchus Restaurant & Lounge on several occasions, but never really ventured inside from the fear of being out of place. Bacchus serves a modern French cuisine featuring West Coast ingredients. The hotel first opened its doors in 1984, a dream of owner Eleni Skalbania since she first began working in the hospitality world. 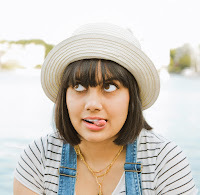 Her youngest daughter, Elpie Marinakis Jackson, has since taken over and continues to uphold the same standard in service and luxury as her mother. 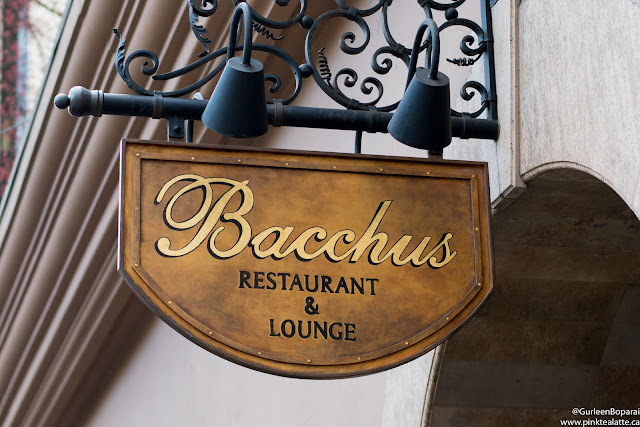 The award-winning Bacchus restaurant is an ode to the Greek god of wine and revelry. The space exudes luxury, from the lush upholstered furniture to the warmth of dark cherry wood fixtures. A large School of Rubens Oil Painting of Bacchus himself overlooks a glossy black grand piano and the space is lit by Murano crystal fixtures imported from Venice. Bacchus boasts an impressive cocktail menu, so it was only fitting that I sampled a few - obviously for research purposes! I had the Seraphim, Singapore Sling and Limonata. 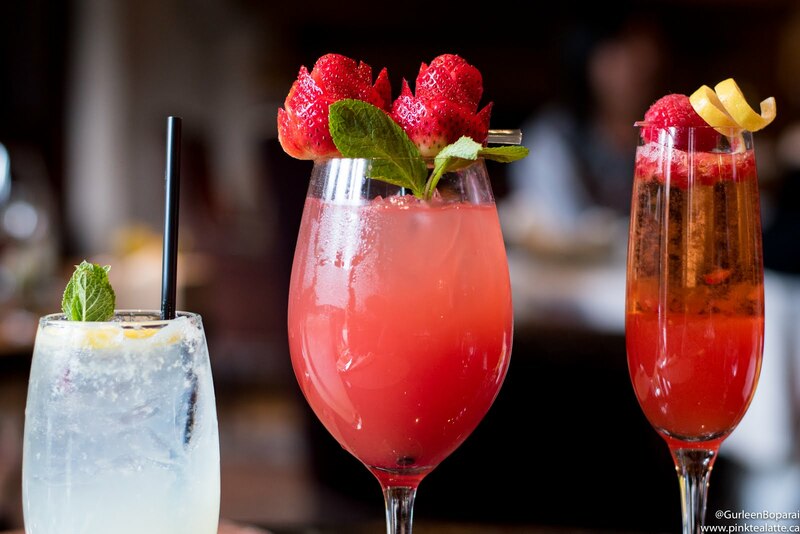 The Seraphim is a 6-ounce sparkling cocktail of Aperol, fresh raspberries, lavender honey and brut which is a very dry unsweetened sparkling wine. I really enjoyed the fresh raspberries and the lemon rind garnish, but being an occasional drinker, the alcohol taste was a bit too strong for me. The Singapore Sling is from their 2-ounce classic cocktail menu and is made with quite the array of ingredients: Bombay Sapphire, Cointreau, Benedictine, Cherry Brandy, Bitters, Grenadine, lemon, lime and pineapple juice. 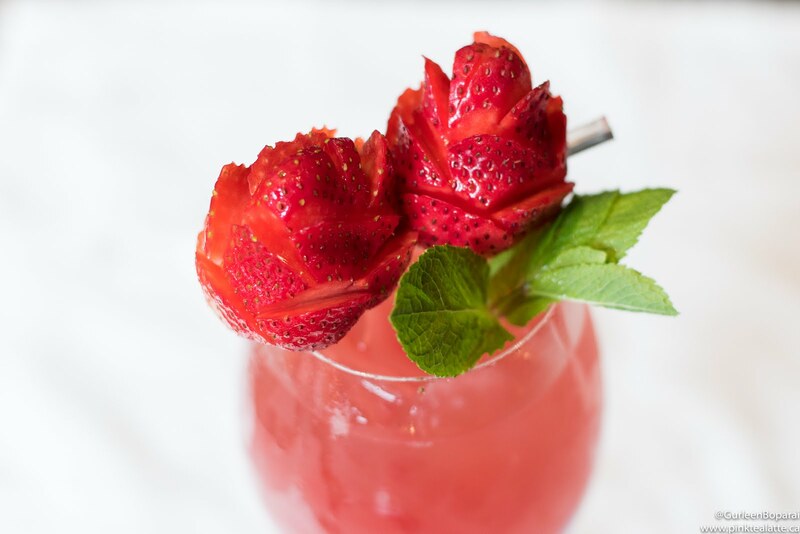 The Singapore Sling is garnished with a sprig of fresh mint and two strawberries hand carved into roses! The grenadine gave it a bright pink red hue and despite it being made with Bombay Sapphire, the Singapore Sling was a burst of the tropics with the pineapple being the predominant flavour. I love non-alcoholic cocktails and it actually turned out to by mine and my friend's favourite of the three. The Limonata was a mix of fresh squeezed lemon juice with a splash of soda and sugar. The drink was a refreshing balance of sweet and sour. From the Lounge Menu, I got to try the Beef Sliders, Mini BC Salmon Crab Cakes, Tagliatelle with Braised Lamb Ragout, and the Pizza Fungi. All of the dishes were plated beautifully and you could really taste the freshness of the ingredients used. Executive Chef Montgomery Lau prefers to change his menu according to the harvest schedule instead by the season. Though it means the spring menu is launched later than most restaurants, it allows him to maximize the amount of fresh locally grown produce in his dishes. 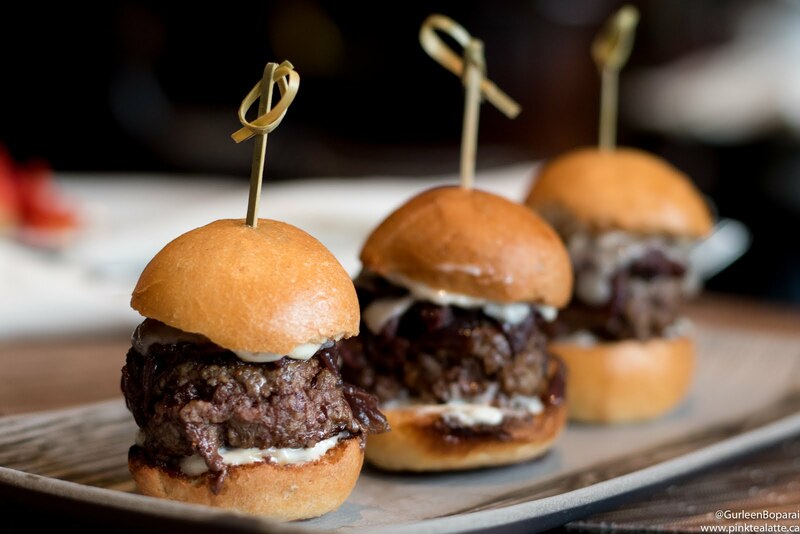 When it comes to caramelized onions, I have an uncontrollable gag reflex, so I was devastated when they brought out the sliders. I had to leave them to my friend to try and he loved them. Grilled red onions, swiss cheese and buttery toasted sourdough buns, but it is the simplicity that made them divine as it allowed the juicy beef patties to shine. Plus they were the cutest perfect little sliders that I have ever seen! 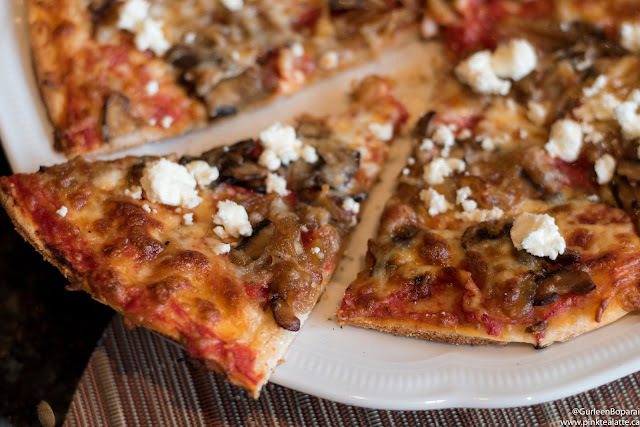 In recent months, Vancouver has seen a massive influx of neapolitan pizza, so Bacchus' Pizza Funghi needed to be on point. A trio of shiitake, button and oyster mushrooms as well as caramelized onions (I remembered to ask for none on my half!) and creamy goat cheese covered a fennel milk bread crust. The crust was a bit stiff, so I ended up having to ditch the fork and knife and just eating the pizza with my hands which is not something you really want to do when eating at a fine dining restaurant. I really loved the addition of fennel in the pizza dough. Fennel seeds are added to the dough for an added depth of flavour. 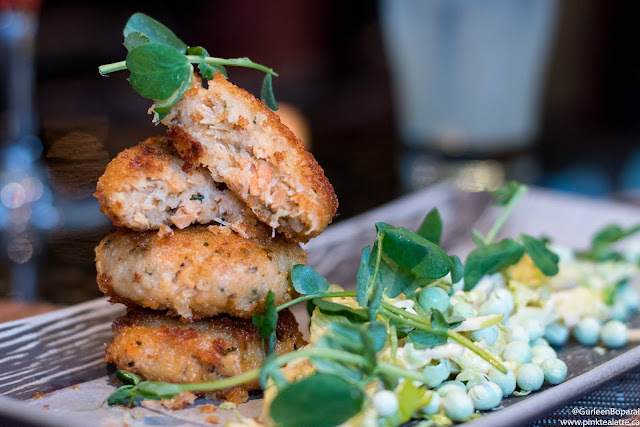 The dish I was most intrigued by was the Mini BC Salmon Crab Cakes that came with a granny smith and celery heart slaw, dried peas and sauce remoulade. They were pan fried to a golden perfection yet still remained moist on the inside. Chef Lau did a great job revitalizing a classic dish. I would like to see some more acidity in the slaw to balance the heaviness of the Salmon Crab Cakes. 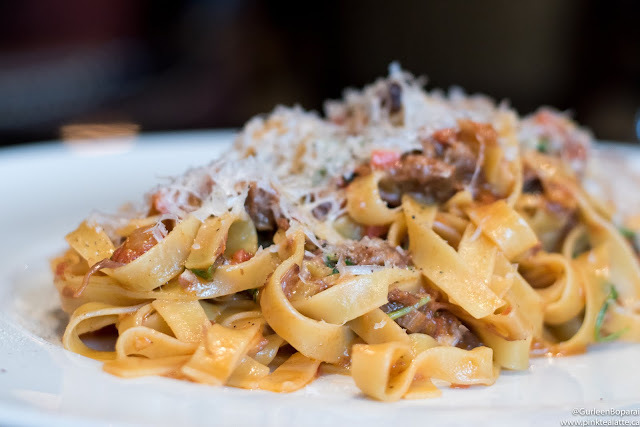 To finish the savoury portion of our meal we had the Tagliatelle with Braised Lamb Ragout. Pasta is one of my favourite comfort foods and Bacchus nailed it. From the very first bite I could tell the pasta was made from scratch and had the right amount of chewiness. The ragout was rich in flavour and enveloped every strand of pasta. They definitely took the time to reduce the lamb in the wine and tomato reduction as there was a huge depth of flavour and the meat was tender. If this blogpost seemed long it is because dinner was equally long as you are meant to relax and take the time to enjoy each course. By the time we got to the pasta, I was partly in a food coma and stuffed beyond belief. 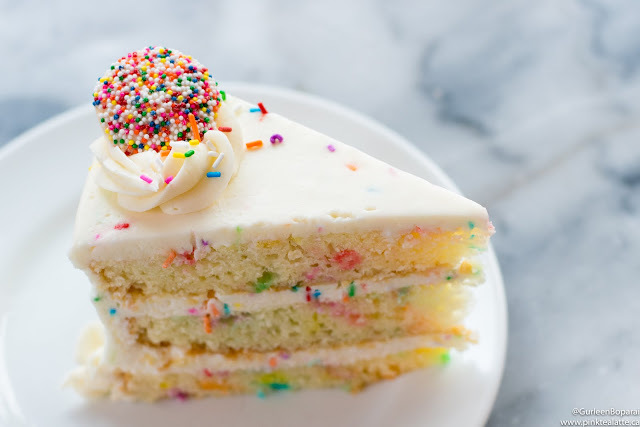 Obviously we dessert, but I am going to share my thoughts on them in a separate post. Let me know in the comments below if you have been to Bacchus and what you think I need to try next from them!